If your question is still not answered please email your question to the market manager at cumberlandfm@gmail.com. Should I order even if something is sold out? What does the 8% virtual booth fee cover? Will you take my egg cartons, bags, and other containers? What if I don't like something I got? What does non-certified organic mean? How can I be added to (or removed from) the mailing list? What do the designations Certified Naturally Grown, Conventionl, No Chem, and USDA Certified Organic mean? To sell through this market you will need to create an account. Once you have done that, go to the http://sewanee.locallygrown.net/growers/list and scroll to the bottom of the page. There you will be able to click to create a grower account. Once you create an account the market managers will receive an automatic email. They will review your account, contact you with any questions and approve you to sell through the market. Once you are approved as a grower, you will need to sign a contract agreeing to the terms and conditions of the market. The market charges growers 4% of sales which provides compensation to the market manager. You can pick up your order at the Sewanee Community Center (behind the Sewanee Market on Ball Park Rd. )Tuesdays from 4:30 to 6:00 p.m. If you order a delivery your order will be delivered to your home on Tuesday evening. Please plan to pick your order up on time or to make alternate plans with the market manager. Left behind orders are subject to late fees and to being eaten by our often hungry volunteers. 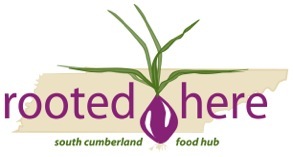 The South Cumberland Farmer’s Market, rooted here, the Sewanee Community Center, and the growers are not responsible for orders which are delivered or left behind. We do not charge a membership fee to use the online market. The online market charges a 8% virtual booth fee to cover overhead expenses. This fee will be automatically added to your order total. Growers pay an additional 4% of sales to compensate the market manager. While membership to the rooted here is not required to use the online market, we depend on member support to carry out our mission of building our local food economy here on the mountain. Memberships are available on the market page. Each Friday evening at 9 p.m., a reminder email is sent to all of our registered customers. Customers must place their order for the week no later than Monday at 10:00 a.m. Orders are placed here on our website. You must have an account to order. (Go to Sign In to create an account if you don’t have one.) To order, sign in, go to The Market and add items you want to order to your cart, and then go to checkout to complete your order. You will receive a confirmation email once your order has been placed. If you need help contact a market manager at cumberlandfm@gmail.com. You can pay for your order at pick up, unless you are a regular delivery customer. We accept cash or checks made out to the Cumberland Farmer’s Market. We also accept debit and credit cards. We regret we can no longer accept EBT/SNAP payment. You may also pre-pay. Your balance will be drawn down each time you order and you will never be charged for items that you do not get. We ask that customers pre-pay by at least $100. This can be done in person at pick up. Pre-payment is easy for customers and market managers! Unlike some co-ops, buying clubs, or CSAs where everyone gets the same box (and you don’t know what you’re getting until you get it), with Locally Grown you get to order what you want, in the quantities that you want, from the farms that you want. The weekly email lists the produce, breads, meat, fresh flowers, and artisan goods available that week, and you can browse the items on this website before you place your order. Growers are asked to estimate how many items they will have available each week (for vegetable growers this involves looking at the live plants and guessing what they will amount to once they are harvested). Sometimes these estimates are off from the actual amount that is available. If a vegetable is “sold out” but you would like to try your luck you may go ahead and order it anyway. Once you get to know your growers you may become aware of the ones that are better at estimating. Some numbers are not estimates. Meat, for instance, is usually in the freezer when it is listed on the website. The market itself does not take any profit from sales. We do however collect enough money to cover overhead expenses. The 8% virtual booth fee covers these expenses. We are charged 2.75% of sales for the use of this great software. We donate and additional 2.75% of our sales to the community center for the use of their building. The market manager receives 1% of sales. The rest goes toward paper, ink, and checks. Growers are charged 4% of sales which also goes toward compensating the market manager. Yes. If the container came from a grower at our market, we will return it to the growers. Please do not return containers that did not come from this market. Please, no bags. There have been occasions (rare ones) when customer were not satisfied with products that they received. If this happens please let us know. Email the grower and the market managers and we will refund your money. We welcome all feedback and negative feedback is especially important in ensuring high quality in the future. Many of our growers are very small. They abide by the USDA National Organic Standards but they are not certified by a third party. This is not because the national standards are too rigorous (many think they are quite lax in some respects) but because the process is too expensive. Growers are encouraged to describe their management on their grower page and in their product listings. Certified Naturally Grown is a non-profit program that certifies small farmers. The standards are a little more strict than the USDA Organic Standards and the cost to the farmer is much lower because it involves a peer review process and not a government bureaucracy. We currently have several growers who are Certified Naturally Grown. If you forget your password or user name go to the Your Account page and click “I forgot my password” and enter your email address. Your user name and a new password will be emailed to you. Please do not open a second account. Log in using the new information and then change your password to something you will remember on the Your Account page. If this does not work or you experience other computer problems, please report them to a market manager cumberlandfm@gmail.com. A weekly email goes out to market customers reminding then that the market has opened for ordering. You may order even if you have not received this email. To be on the market mailing list, visit the “Your Account” page and click on “create an account”. If you have moved away and would like to be removed from the mailing list, you can remove yourself on the “Your Account” page once you have logged in. Additionally, you may click on “unsubscribe” at the bottom of an email. Certified Naturally Grown denotes farmers who are registered with Certified Naturally Grown, a non-profit program that certifies small farmers. The standards are a little more strict than the USDA Organic Standards and the cost to the farmer is much lower because it involves a peer review process and not a government bureaucracy. Conventional denotes farmers who use chemical fertilizer and/or weed and pest control methods forbidden by the USDA National Organic Standards. No Chem denotes non-certified organic farmers who abide by the USDA National Organic Standards, but are not registered with the program. This is not because the national standards are too rigorous (many think they are quite lax in some respects) but because the process is too expensive. USDA Certified Organic denotes farmers who are certified organic by the USDA and abide by the USDA National Organic Standards. N/A means not applicable, a designation for producers who sells goods other than produce.